The Mennonite Church, sometimes familiarly called the "Old" Mennonite Church in contradistinction to certain schismatic "new" Mennonite groups formed from it, such as the Reformed Mennonite (founded in 1812 in Lancaster County, Pennsylvania), the Eastern District of the General Conference Mennonite Church (founded in 1847 in the Franconia area in Bucks and Montgomery counties, Pennsylvania), and the Indiana and Ontario districts of the United Missionary Church (formerly called Mennonite Brethren in Christ, founded in 1875). It was the oldest (1683 ff.) and largest (77,369 baptized members in 1956) Mennonite body in North America. The total membership in 1956 was 81,472, distributed by countries as follows: United States 70,513, Canada 6,856, foreign mission areas 4,103 (India 1,613, East Africa 1,212, Japan 86, Argentina 655, Puerto Rico 335, Sicily 73, Belgium 28, Ghana 26, Honduras 28, Cuba 13, Jamaica 30). In 1956 it was composed of 20 district conferences—three in Canada, fifteen in the United States including Puerto Rico, and three abroad formed from missions, viz., India, Japan, and Argentina, besides two dependent mission conferences, viz., East Africa and Bihar in India. Mennonite Church (MC) congregations in the U.S.A. and Canada, 1950s. Source: Mennonite Encyclopedia, vol. 3, p. 610. The Mennonite General Conference, which was organized in 1898 and met biennially, was an advisory body of considerable importance, but the authority of the church resided in the district conferences, not all of which were officially represented in the General Conference sessions. In 1957 the following conferences participated in the general work and fellowship of the church, but without official delegates in the General Conference: Conservative, Franconia, Lancaster, Ontario Amish, and Washington-Franklin. All of these but the last, however, had official representatives in the General Council of the General Conference. The Mennonite Church thus existed prior to its General Conference and existed apart from it in the 1950s. The mark of "belonging" to the general body of the church was intercommunion and pulpit fellowship. The Mennonite Church historically had two ecclesiastical backgrounds, but only one ethnic. Ethnically the body of the membership was Swiss-South German in origin, except for the small number of families from the Lower Rhine area and Hamburg-Altona who settled in Germantown in 1683-1707. Only scattered individual families of Dutch, Prussian, or Russian background were to be found in its membership in the 1950s, and no entire congregations of such persons, or of Lower Rhine background. Only one congregation in the 1950s was exclusively of Swiss background, viz., Kidron, Ohio. The one Dutch congregation at New Paris, Indiana, founded in 1853, has died out. Ecclesiastically the group had two constituent backgrounds, viz., Mennonite and Amish Mennonite. The following conferences are exclusively (with minor exceptions) Mennonite: Franconia, Lancaster, Virginia, Washington-Franklin, and Ontario. Exclusively Amish are the Conservative and Ontario Amish Mennonite conferences. The rest were of mixed background, resulting largely from mergers in 1916-1925. The sense of Amish background practically vanished in all but the Conservative and Ontario Amish conferences. The differences largely disappeared, although locally some echoes of earlier differing traditions remained. The European geographic backgrounds of the Mennonite and Amish elements, however, were rather distinct. The Mennonite element all came originally from the Palatinate in 1707-1756 or Switzerland 1710-1756, whereas the Amish came either from Switzerland and the Palatinate (a small number) in 1730-1756 or from Alsace-Lorraine, Zweibrücken, Bavaria, and Hesse-Cassel 1815-1860, with stragglers down to 1900. The relative proportion of Mennonite and Amish background elements in the sixteen North American conferences in the 1950s was about 70 per cent to 30 per cent. Omitting the two entirely Amish conferences, the ratio of the rest of the church was 75 to 25, with some 22,000 members of Amish background. 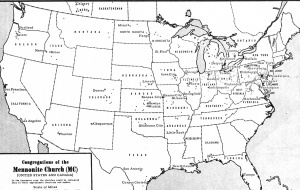 The only Mennonite (i.e., non-Amish) settlements made directly from Europe (except the Swiss settlement in Wayne County, Ohio, 1817-1830) were those in the Franconia and Lancaster districts; all other Mennonite settlements or congregations further west were derivative from these. Most Amish settlements were founded directly from Europe, but all Amish settlements west of Ohio except Illinois were derivative. Organizationally the work of the Mennonite Church at large was carried on by three major church-wide boards—the Mennonite Board of Missions and Charities (organized in final form in 1906), which carried on foreign and home missions, charitable homes, and relief and service work, the Mennonite Board of Education (organized in 1905), which operated Goshen and Hesston colleges, the La Junta School of Nursing, and the Mennonite Publication Board (organized in 1908), which worked through the Mennonite Publishing House. All these boards were autonomous and self-perpetuating, but were anchored basically in the district conferences by a membership elected directly by them. All the district conferences also had their own mission boards, largely for home missions; the Lancaster, Franconia, and Virginia conference boards, however, also had foreign missions, the former operating an extensive program in Africa. Some of the district conferences also operated institutions such as schools (e.g., Indiana-Michigan had Bethany Christian High School, Ontario had Rockway School, Virginia had Eastern Mennonite College), or homes for the aged (e.g., Ontario had Fairview), and sponsored mutual aid organizations. In most district conferences the mission boards published periodicals promoting the work of the conference in missions, evangelism, and service. On the other hand, the General Conference, although it did not operate any institutions either directly or indirectly, did carry on a certain amount of promotional and advisory activity and certain administrative assignments through its standing committees such as the Commission for Christian Education, Peace Problems Committee, Ministerial Committee, Music Committee, etc. In matters of finance there was no church-wide budget, except a budget for the specific general conference activities. Funds for the church-wide boards, district boards, and local institutions were secured by offerings or solicitation, locally or generally as the case may be. In church polity the Mennonite Church used traditionally elements of several types of polity, but basically it had a synodal polity with the district conferences having general authority over the congregations. Reserved to the congregations were all local matters, including selection of ministers and ownership of church buildings. Matters of doctrine and practice, including discipline, were the prerogative of the district conferences, which had the power to discipline ministers and congregations. The traditional triple congregational ministry of bishop, preacher, and deacon still prevailed in most district conferences in the 1950s, although there was a significant trend away from the office of bishop. For example, two district conferences, South Central, and Ohio and Eastern, suspended bishop ordinations, and were using the idea of district superintendent in some form. In the other conferences, bishop districts (dioceses) of from two to ten congregations or mission stations were the rule, although in areas with Amish background the general pattern was a bishop in each major congregation. In the Lancaster Conference the bishops as a body constituted a sort of upper house in the conference, and were called a "bishop board," which exercised considerable power. In the other conferences all ordained men had equal voice in conference work, regardless of office. The office of deacon was declining in some areas. The Mennonite Church has suffered a number of schisms. Interestingly, none was due to a major issue in doctrine, all being due primarily to differences over progressive and conservative attitudes in church work or strictness in discipline, or to miscellaneous and personal difficulties. These schisms are all described under the pertinent articles: Funkites in Franconia 1778, Reformed Mennonite or Herrites in Lancaster 1812, Stauffer in Lancaster 1845, Eastern District General Conference Mennonite or Oberholtzer division in Franconia 1847, Church of God in Christ, Mennonite or Holdeman in Ohio 1859 (actually not a true schism), Defenseless or Egly among the Amish of Indiana, Illinois, and Ohio in 1864, Old Order Mennonite or Wisler in Indiana and Ohio in 1871-72 (Ontario similarly in 1889, Lancaster in 1893, Virginia in 1903), Central Illinois or Stucky Amish in 1871 (organized first in 1898), Mennonite Brethren in Christ or Brenneman division in Indiana and Ontario about 1875. Progressive groups also broke off in several places in 1924-1930 (Indiana, Ontario, Ohio, Pennsylvania) which never organized a conference but transferred gradually to the General Conference Mennonites. In contrast to these schisms the reunion of the largest section of the Amish body with the main body of the Mennonite Church, beginning with the adherence of Amish conferences to the Mennonite General Conference in 1898 ff. and to the general churchwide boards in 1892 ff., should be noted as a major achievement in Mennonite unity in North America, exceeding in size of membership involved the total of all the schisms listed above. The history of the Mennonite Church falls readily into four major periods: Colonial 1683-1783; Westward Migration 1783-1860; Strain and Stress (overlapping) 1840-1890; Great Awakening 1890-1910; Consolidation and Forward Movement 1910-1957. Although advance contingents came early, such as the first Lower Rhine urban immigrants, who began to arrive at Germantown in 1683 and formed a congregation apparently as early as 1690 with William Rittenhouse as preacher, and also a few from the Palatinate in 1707 and Switzerland (1710 to Lancaster), the main body of rural immigrants (about 4,000-5,000) came from the Palatinate in 1717-1756, splitting about equally between the Franconia district twenty to fifty miles north of Philadelphia and the Lancaster district fifty to eighty miles west of Philadelphia. The small number of Colonial Amish settled approximately at the junction of Lancaster, Chester, and Berks counties in 1738-1756. The two Mennonite settlements remained distinct, without organic union, as did the smaller Amish group. However, delegates from the two Mennonite settlements met conjointly as early as 1725, probably in Germantown, to adopt the Dutch Dordrecht Confession of Faith of 1632 as their own and arrange for its publication in English (1727). Since the Amish in Europe had already adopted this Confession, Dordrecht became and remained the accepted confession of the Mennonite Church of North America. In the colonial period the major Mennonite books published in America (Germantown or Ephrata) were the hymnal Ausbund (1742), the martyr book (Güldene Aepfel (1745), the Martyrs Mirror (1748), the devotional Bible history Die wandelnde Seele (1768), the catechism Christliches Gemütsgespräch (1769), the prayerbook Ernsthafte Christenpflicht (1770), and two books by a native author, Spiegel der Taufe (1744) and Eine Restitution (1763) by Bishop Heinrich Funck of Franconia. In the colonial century the Pennsylvania Mennonites established their solid communities, successfully transferring their traditional faith and practice from Europe and retaining the German language. But they were subject to considerable pietistic influence, largely through literature, and suffered some loss from the Wesleyan revivalistic influence in the latter part of the period and on into the 19th century. A Lancaster bishop, Martin Boehm (excommunicated about 1777), was a co-founder of the United Brethren Church and led a considerable body of Mennonites, including several ministers (e.g., Christian Newcomer), into the new group which he formed with Philip Otterbein, which was in process of crystallization from 1767 on (notable meeting in Isaac Long's barn in that year). About the same time (1770) began the small rather pietistic movement called the River Brethren (Brethren in Christ), led by Jacob Engel, a Mennonite layman in western Lancaster County, although the real emergence of the group did not take place until 1785 with the first baptisms by Engel. A considerable part of the new group was composed of former Mennonites. The Mennonites have been described by some writers as having had a part in the Great Awakening of 1744 ff., but this has not been proved. Culturally they were an integral part of the large Pennsylvania German block of Eastern Pennsylvania. The French and Indian Wars (1756-1763) and the Revolutionary War (1776-1783) created considerable difficulty for the nonresistant Mennonites, who successfully maintained their position of complete non-participation in war. In this they were helped by the Quakers, who controlled the provincial government of Pennsylvania to 1756 and who had great influence even after that. The first schism, the one led by Bishop Christian Funk of Franconia (1778), occurred over the question of paying the war tax and in general supporting the American revolutionary side against England, although military service was not involved. The end of the fighting, and the creation of more stable conditions made possible the great American westward migration across the Alleghenies into the vast central plain of Western Pennsylvania, Ohio, Indiana, Illinois, and Iowa, as well as into Ontario. The shortage of available land in the East furnished considerable pressure. Many Mennonites joined the migration, some going northwest into Ontario, some straight west to western Pennsylvania (Somerset and Westmoreland counties, etc.) and on into Eastern Ohio, and some south through the Cumberland Valley from Harrisburg into Maryland, and on down into the Shenandoah Valley in Virginia. By 1840-1850 derivative settlements (families from Virginia, Eastern Ohio, and Ontario) were being established in western Ohio and northern Indiana, with small and scattered settlements soon after in Illinois. The few Mennonite settlements in Missouri and Kansas were made mostly after 1870. The movement reached Colorado, North Dakota, and Oregon, as well as Alberta and Saskatchewan (from Ontario and Nebraska chiefly) about the turn of the 20th century or soon thereafter. California received only scattered settlers, with the first organized congregation in 1921. Michigan received its Mennonites mostly after 1900 (a few 1865-1900, chiefly from Ontario). The total Mennonite (non-Amish) population west of Indiana and west of Ontario in Canada has never been large, and in 1956 was less than 6,000 baptized members. The Amish also shared in the westward migration, although many of the Amish settlements were made directly from Europe as follows: Waterloo County (Ontario), Somerset County (Pennsylvania; partly from Hesse, partly from Lancaster County), Stark and Fulton counties and part of Wayne County (Ohio), central Illinois, and part of Wayland (Iowa). These were mostly Alsatian Amish settlements made in 1825-1860. Derivative settlements from Lancaster County were made in Mifflin County (Pennsylvania) and Fairfield County (Ohio), West Liberty (Ohio), Topeka (Indiana), Cass County (Missouri), Hubbard (Oregon), and partly Wayne County (Ohio), all made from ultimately Lancaster County Amish stock. Holmes County (Ohio), Elkhart and Lagrange counties (Indiana), and Johnson County (Iowa) were made largely of Hessian Amish stock from Somerset County (Pennsylvania), Leo (Indiana), Wayland (Iowa), most Nebraska settlements, Pigeon (Michigan), Fairview (Oregon), and Tofield (Alberta) were derivative, settled largely by Amish families from Ohio, Ontario, or Illinois, ultimately from Alsace. Characteristic names enable a fairly accurate tracing of derivation. The Amish (Mennonite) settlements west of Indiana are nearly twice the size of the Mennonite, almost 10,000 in membership. The total membership of all district conferences west of Indiana and Ontario in 1956 was 15,811. West of the Mississippi in the USA it was about 11,400. The 19th-century westward migration was completely rural, largely based on free or very cheap government homestead land (numerous attempted smaller settlements vanished for various reasons). All carried with them substantially the traditional faith and practice of the mother communities. Gradually, however, the freer life of the frontier resulted in a less conservative and more flexible type of church life and attitude, and prevented the development of the somewhat radical conservative trend or purely static condition which characterized sections of the East until the mid-20th century. Most of the newer methods of church work and activities which came into the Mennonite Church in the 20th century developed in the newer midwestern settlements in Ohio and Indiana. The limits of this period overlap somewhat the previous one because of the nature of the historical developments. It can be characterized as one of strain and stress, because it was in the fifty years of this period that all the major schisms among both the Mennonite and Amish wings occurred. Outside influences, especially from the Alleghenies westward and in Ontario, but also in Eastern Pennsylvania and Virginia, put great pressure upon the tradition-bound Mennonite communities. Chief among these influences were the Sunday school and revivalism, the Methodist (English) and United Brethren and Evangelical (German) evangelists and camp meetings, a pietistic type of literature, etc., all of which had weighty influence, and resulted in the loss of many members to the more aggressive denominations. Many Mennonite leaders, pressed by conservative laymen, were inclined to resist most innovations, and often those who wanted progress had great difficulty in making their influence felt, or tended to become seriously dissastisfied. The struggle over the German language and the transition to English added to the strain and stress. At times it seemed that the main body might be so weakened by the struggle and the defections right and left that it would completely disintegrate, as some communities actually did. But the outstanding leadership of several able and devoted men of vision in the Midwest, in particular Bishop John M. Brenneman (1817-1895) of Allen County (Ohio), and John F. Funk, publisher (1835-1930), and J. S. Coffman (1848-1899), evangelist, both of Elkhart (Indiana) did much to turn the tide, both in progress and in unity. The outside influences did in some respects have a wholesome influence. The work of Brenneman, Funk (1864 on), and Coffman (1879 on), assisted and supplemented by others, soon began to bear fruit. Sunday schools were accepted and did their good work in Bible teaching and lay activity from 1863 on (first Sunday schools at Masontown, Pa., and Kitchener, Ontario, about 1840). The spirit of evangelism and revival was spread by J. S. Coffman's widespread itinerant work, followed by others who imitated him such as J. S. Shoemaker, Daniel Kauffman, D. D. Miller, S. G. Shetler, Noah Stauffer, and A. D. Wenger. New life was awakened, and thousands of young people were gathered in who otherwise would have been lost to the Mennonite Church. The spirit of missions arose (first home mission, Chicago 1893; first foreign mission, India 1899), church schools were established (Elkhart and Goshen 1894-1903, Ontario Bible School 1907, Hesston 1909), Sunday-school conferences were held (1891 the first in Indiana), young people's meetings began to spring up (first in Elkhart, Indiana, and Smithville, Ohio, about 1893). It was a remarkable awakening to new spirit and life internally, and to a new sense of mission and outreach to the world. The church was transformed, first in the Midwest and Ontario, then in the East as well. Finally the General Conference was launched in 1898 and the three great church-wide boards established in 1905, 1906, and 1908. A splendid fruit of the new spiritual life and activity was the growing sense of unity and the need for closer cooperation among the scattered congregations, settlements, and conferences, which manifested slightly varying traditions, and at times varying degrees of progress. The consolidation of the results of the Great Awakening and the unifying of the church were manifested in various ways, e.g., in the growing strength of the General Conference which at first was supported by less than half of the church, in the formation of the three boards with their church-wide representation and operation, particularly in the earlier period the mission board at Elkhart, and in the growing influence of the central church publishing house at Scottdale, with the church organ, the Gospel Herald, and its vigorous editor, Daniel Kauffman. It was manifested also in the formal merger of the Amish and Mennonite conferences in 1916-1925. The growth and wider influence of the church schools at Goshen and Hesston, joined by Eastern Mennonite College in 1917, was also both a token and a force in the consolidation and unification. In spite of serious tensions in the twenties and thirties over the degree of change permissible in the traditional expression of nonconformity to the world (with the Midwest changing more rapidly and substantially than the East) the church on the whole moved vigorously forward on all fronts and maintained its unity. The delayed awakening in the East (Lancaster and Franconia) was largely compensated in the 1930s to 1950s. World Wars I and II had significant effects upon the church. On the one hand the severe testing of its nonresistant position, through the military draft and related war measures such as the sale of war bonds and war industry, brought a significant rallying of strength and clarification of position. While certain weaknesses were revealed, basically the church took a united and strong stand and contributed much to the clarification and unification of the nonresistant position of the entire North American Mennonite brotherhood. On the other hand, the experiences of Civilian Public Service, with the great foreign relief effort after World War II, and the development of voluntary service, greatly stimulated and challenged the church and its youth. Another result was the growing discovery and appreciation of other branches of the Mennonite brotherhood. Outside currents of influence were not without their effect on the church also in this period. Modernism had scant influence, but the Fundamentalist-Modernist controversy in America had its echoes within the church, which although it succeeded in keeping out of the outright Fundamentalist movement, because of strong sympathies for the general anti-modernist position was definitely influenced by it. One fruit of this influence was the adoption of a statement of doctrinal position by the General Conference in 1921, called A Statement of Christian Fundamentals, the only original general doctrinal statement ever adopted by the church. It was in this period too (1910-1940) that millennialism made considerable inroads with the result that a substantial number of both ministers and lay members followed this type of prophetic interpretation. Dispensationalism, however, has been rejected. There has apparently been a decline in interest in millennialism in the 1950s. The growth of confidence in education and its value for the cause of the church was marked in the 2nd quarter of the 20th century. In higher education two full four-year colleges and one junior college had an extraordinary growth in attendance (in 1956-57 over 1,000 college students) and plant and resources. In secondary education nine four-year high schools were established across the continent from 1942 to 1957 in addition to the two at Eastern Mennonite College and Hesston, with a total enrollment of over 1,500 in 1956-57. In elementary education a remarkable development took place after 1939 when the first Mennonite Christian day school was established in Eastern Pennsylvania (preceded by two Amish schools in Delaware of 1925 and 1938 and an Amish school of 1938 in Pennsylvania). In 1956-57 there were 88 such schools in operation, 20 of them Amish. Pennsylvania alone had 45 elementary schools, most of them in the Lancaster area. Almost every congregation throughout the church also had a summer "Bible school of two weeks' duration. The changing concept of the minister's work also led to the demand in various quarters for a better trained ministry, and along with this, the preference for the one-pastor system with full or partial support. In Ontario, Ohio, Indiana, Kansas, and Illinois this change came rapidly from the late 1940s-1950s. To serve this demand the Mennonite Board of Education established at Goshen College the Biblical Seminary (beginning in 1933, separate organization in 1944), which after 1947 offered a full graduate course, and graduated about 200 persons from all curriculums by 1957. Eastern Mennonite College also added an advanced Bible training program. However, the majority of congregations in the 1950s were still served by ministers without full support and only a small amount of special training. The publication work of the church also showed a significant expansion by the 1950s. Whereas John F. Funk's Mennonite Publishing Company in Elkhart (organized 1875, although his publishing work had begun in Chicago in 1864) published chiefly the church paper Herald of Truth and the large historical volumes such as Menno Simons Works and the Martyrs' Mirror, and hymnbooks, it had little original production by Mennonite writers to issue. Funk's influence was exercised chiefly through the Herald and Sunday-school helps. He was also handicapped by a bilingual constituency. With the shift to English in 1890-1910, the establishment of the Mennonite Book and Tract Society (1892-1908), and the Gospel Witness Company (1905-1908), followed by the general church agency, the Mennonite Publishing House (est. 1908 at Scottdale), and the emergence of two capable writers, Daniel Kauffman and John Horsch, the literary output expanded in quantity and improved in quality. The periodical literature and the Sunday-school helps became increasingly influential. By 1930 a younger generation of writers, many of them associated with the three colleges of the church, but particularly Goshen College and Biblical Seminary, emerged, and the 1940s & 1950s witnessed the flowering of a historical, theological, and practical literature outstanding in American Mennonite history. The Conrad Grebel Lectureship, established in 1952, contributed measurably to this. The rise and growth of the missionary and philanthropic interest in the church in the past 50 years has been a notable development, greatly intensified in the late 1940s and 1950s. Foreign mission fields were entered as follows: India 1899, Argentina 1917, East Africa 1934, Bihar (India) 1940, Argentine Chaco 1943, Puerto Rico 1945, Ethiopia 1948, Japan 1949, Sicily 1949, Honduras 1950, Belgium 1950, Luxembourg 1951, England 1952, Somalia 1953, France 1953, Israel 1953, Alaska 1954, Brazil 1954, Uruguay 1954, Cuba 1954, Jamaica 1955, Vietnam 1957. The remarkable growth in home missions in the past twenty years has brought the number of mission outposts operated either by congregations alone or by mission boards to over 300, scattered over many states outside of original Mennonite territory, including-Vermont, New York, North Carolina, Kentucky, Tennessee, Alabama, Florida, Georgia, Texas, Minnesota, northern Michigan, northern Ontario, northern Alberta. New types of mission activity developed such as African American missions (25 in number by 1957), Jewish missions, missions among the Mexicans. Radio broadcasting with a basically evangelistic purpose has developed into a major thrust, with the Mennonite Hour, established in 1952, after 1955 operating under the Mennonite Board of Missions and Charities, with over 70 stations, and a Spanish broadcast with 10 stations, to which additional foreign language broadcasts in Italian, French, German, and Russian were to be added. A European studio was established in Basel, Switzerland in 1957. A remarkable growth in charitable institutions was also to be noted. In 1957 the church maintained five children's homes and eighteen homes for the aged, owned two hospitals in North America, and operated four more as well as one mental hospital. It was a strong supporter of the Mennonite Central Committee from its beginning in 1920, and carried on in addition a large voluntary service program of both summer short-term and year-round units in numerous states and provinces. Much of this was administered by the Mennonite Relief and Service Committee under the general mission board, but the Lancaster Conference mission board also operated a vigorous program of voluntary service. Organized mutual aid also developed in a large way, particularly after 1910. District organizations for mutual aid in property losses became almost universal. The first such was in Ontario, beginning in 1867. The Mennonite Aid Plan, organized in Indiana in 1882, served a larger area. In 1945 a church-wide organization, Mennonite Mutual Aid, Inc., was set up under the General Conference to provide hospitalization and surgical aid, also burial aid;, automobile accident aid was later added. In the 1950s the concept of organized aid of various types was generally accepted. The strong position against commercial life insurance in all forms originally taken still generally held, although some modified forms of insurance with investment features were coming into use. The church in general maintained a strong position in regard to nonconformity to the world in the 1950s, holding that the full Christian life will of necessity expressed itself in nonconformity to the world in life and conduct. Its ideals included simplicity in life and costume, rejecting attendance at the theater including motion pictures, the wearing of jewelry, the swearing of oaths, lodge membership, divorce, smoking and drinking, participation in politics and office-holding, membership in labor unions, participation in war or carnal strife of any kind, and advocating simplicity in worship without the use of musical instruments. There was universal observance of the ordinance of feetwashing, the prayer veil for women, and close communion. In the application of this principle of nonconformity and simplicity the church in general maintained a conservative position, with real church discipline, seeking to avoid the evils of legalism and formalism on the one hand and worldliness on the other, though not always successfully. While weaknesses manifested themselves frequently at various times and places, in general the church maintained its principles and ideals. Among the means used to this end in in the mid-20th century were pronouncements by the General Conference on various major questions of practical Christian living, including the following: Peace, War, and Military Service (1937), Industrial Relations (1941), a Declaration of Christian Faith and Commitment (Nonresistance) first by an all-Mennonite study conference at Winona Lake (1950), Race Relations (1955), and Christian Separation and Nonconformity as a Whole (1955). The declarations of position and commitment, while not having the force of confessions of faith, nevertheless carried great weight and influence. The Mennonite Church (MC) is that branch of the world Mennonite communion composed largely of congregations growing out of early Swiss-South German Mennonite and Amish immigration to North America, sometimes referred to as "Old Mennonites." Alongside the General Conference Mennonite Church (GCM) and the Mennonite Brethren, it is one of the three main Mennonite groups in North America. In 1997 membership in the Mennonite Church (MC) in North America stood at 112,311; there were 14,983 members in 117 congregations located in Canada, and 97,328 members in 1,005 congregations in the United States. The Mennonite Church (MC) in the United States and Canada is organized into conferences, the majority of which participate in Mennonite General Assembly. The assembly is an agency designed to corporately carry forward the ministry and mission of the church. Participating conferences in 1997 were: Allegheny Mennonite Conference, Atlantic Coast Conference of the Mennonite Church, Franconia Mennonite Conference, Franklin Mennonite Conference, Gulf States Mennonite Conference, Illinois Mennonite Conference, Indiana-Michigan Mennonite Conference, Iowa-Nebraska Conference of the Mennonite Church, Lancaster Mennonite Conference, Mennonite Conference of Eastern Canada, New York Mennonite Conference, North Central Conference, Northwest Mennonite Conference, Ohio Conference of the Mennonite Church, Pacific Northwest Mennonite Conference, Pacific Southwest Mennonite Conference, Puerto Rico Mennonite Conference, Rocky Mountain Mennonite Conference, South Central Mennonite Conference, Southeast Mennonite Conference, and Virginia Mennonite Conference. Mennonite Church (MC) conferences not participating in Mennonite General Assembly in 1997 included: Bethel Conservative Fellowship, Bible Mennonite Fellowship, Caribbean Evangelical Mennonite Mission, Christian Anishinabec Fellowship, Conservative Mennonite Church of Ontario, Conservative Mennonite Fellowship, Cumberland Valley Mennonite Church, Fellowship Churches, Hope Mennonite Fellowship, Mennonite Christian Fellowship, Mid-Atlantic Mennonite Fellowship, Midwest Mennonite Fellowship, Pilgrim Mennonite Conference, South Atlantic Mennonite Conference, Southeastern Mennonite Conference, Washington-Franklin Mennonite Conference, Western Conservative Mennonite Fellowship, Conservative Mennonite Churches of York and Adams Counties, Pennsylvania, and a large group of unaffiliated Mennonite churches. There are also many thriving overseas Mennonite congregations. Some of these grew out of Mennonite Central Committee involvement, and some have fraternal relationships with General Conference Mennonite agencies or other Mennonite organizations. By the mid-1950s the vast expansion of mission and service programs in the Mennonite Church (MC) presented a major challenge to existing program structures and patterns of religious life. North American Mennonites were also becoming highly trained and educated, full participants in business and the professions. Those who remained in agriculture similarly found their situation transformed by pressures to specialize and mechanize. In the coming decades institutionalization, professionalism, and internationalism would increasingly characterize the Mennonite Church (MC). Volunteer opportunities of short duration such as Mennonite Disaster Service supplemented longer term relief and service projects, greatly increasing the number of people able to participate. (Most of the above-mentioned organizations involve other Mennonite groups in addition to the Mennonite Church [MC].) Limitations on associations with non-Mennonite organizations and activities were relaxed. Simultaneously, multiple congregational, conference, and church-wide activities were being organized, generally under the leadership of lay persons. The 1960s were a time of reinterpretation, characterized by leadership and organizational adjustments to changed reality. A new Mennonite Confession of Faith was adopted in 1963 in the context of discussions saturated with the theme of change; this confession was supplemented by the jointly-adopted Mennonite Church/General Conference Mennonite Church Confession of Faith in a Mennonite Perspective at the 1995 joint sessions. At the Mennonite Church (MC) general conference sessions (the forerunner of the Mennonite General Assembly) held in Lansdale (Pennsylvania) in 1961, communion was served for the first time at such a gathering. The event signaled the waning of the practice of close communion, which allowed only members in full fellowship to participate in congregationally-based communion services. It also heralded the relaxation of discipline, which had been closely tied to the preparatory meeting which preceded close communion. Dress restrictions were eased, making the plain coat no longer mandatory for ministers and church workers and easing the recommended wearing of bonnets by women members. The use of musical instruments in worship became widespread, although many congregations retained unaccompanied singing. Cut hair and the wearing of slacks by women members became commonplace, as did the wearing of jewelry. Participation in competitive sports became a structured part of school programs, and theater (dramatic arts) and motion picture attendance became acceptable. Following careful study processes the prayer veil for women became optional in many conferences. Divorce and remarriage was also studied on a conference and a congregational level and restrictions were eased. The increasing face-to-face contacts in service projects at home and abroad challenged a nonresistance expressed primarily by passive withdrawal. In 1961 a new statement, "The Christian Witness to the State," was adopted by general conference and appended to the 1951 statement, "A Declaration of Christian Faith and Commitment with Respect to War, Peace, and Nonresistance." Although the position outlined in the new statement remained controversial, it supported a much more active peace witness than had previously been affirmed. A change in church polity on the congregational and conference level accompanied a church-wide reorganization study which was initiated in the mid-1960s. There was a general return to congregational autonomy, with conferences being advisory. Some of the conferences continued to administer programs such as missions and voluntary service. On the congregational level the bishop, preacher, deacon pattern was altered in many areas to that of pastor or pastoral team, together with a church council or a board of elders or both. Increasingly ministers were salaried, in some cases also seminary trained, although part-time ministry, with or without special training, continued. In some instances a conference minister performed many of the functions earlier carried out by the bishop. In other areas overseers performed these functions. Conference training programs, which supplemented seminary training, were initiated. Women began serving in ministry: some were ordained, serving as pastors or copastors; many more served as part of a team ministry. Following an extensive study process, the various regional conferences in the Mennonite Church (MC) in the United States and Canada became organized in a Mennonite General Assembly, a structure formally approved at a Constitutional and General Assembly held at Kitchener, Ontario, 16-19 August 1971. The assembly, which meets biennially, is made up of delegates proportionately representing the participating conferences. A moderator is selected to serve one biennium as assistant moderator and the following biennium as moderator. The work of the general assembly is carried forward by an executive secretary and board and agency secretaries who, together with regional conference representatives, make up a general board. A Nominating Committee develops a constituency-wide slate of nominees from which individuals are elected or affirmed to the various committees and boards by vote of the delegates to the general assembly. Women participate on the boards and committees, and in administrative positions. A Council on Faith, Life, and Strategy discerns issues needing consideration and reports directly to the General Board and the General Assembly. The General Board of the General Assembly coordinates the work of five program boards: Mennonite Board of Congregational Ministries, Mennonite Board of Education, Mennonite Mutual Aid Board, Mennonite Publication Board, and Mennonite Board of Missions. Each program board is represented at the general board level through its executive secretary, and in turn is advised by its own board composed of representatives from constituent congregations and conferences. The five boards have independent budgets which are reviewed by the general board and presented to the general assembly for approval. The Mennonite Board of Congregational Ministries has departments responsible for services to congregational education, evangelism, family life, and leadership. Each department is directed by a staff secretary, who is advised by a commission representing the constituency. Additional departments deal with peace and service concerns, congregational program planning, stewardship, worship and the arts, and youth ministries. The board maintains a Ministerial Information Center to assist with pastoral placement. Approximately 50 church camps, campgrounds, retreat, and conference centers relate to the board through the Mennonite Camping Association. The Mennonite Board of Education gives guidance to the operation of three colleges and two seminaries. It also works in a coordinating and consulting relationship with 14 Mennonite high schools (coordinated by the Mennonite Secondary Education Council) and 22 elementary schools. The Mennonite Board of Missions is headquartered in Elkhart (Indiana) with a regional office in Harrisonburg (Virginia). Many conferences also operate their own mission boards. The fourth program board, Mennonite Mutual Aid, has experienced vast growth, and serves General Conference Mennonite Church, Mennonite Brethren, and other members of the Mennonite Central Committee (U.S.) constituency. The Mennonite Publication Board, through the Mennonite Publishing House and Herald Press, publishes books, congregational literature, and periodicals, including the denominational organ, the Gospel Herald. This publication merged with the General Conference Mennonite Church publication, The Mennonite, in February, 1998, to form a new integrated U.S. Mennonite publication, also called The Mennonite. Several bookstores also serve the constituency. Christian education publications have included far-reaching inter-Mennonite publishing projects such as the Foundation Series for Sunday schools. The Mennonite Yearbook, published annually by Mennonite Publishing House, contains listings of conferences and congregations, their membership, and designated leaders. Sections detail the staff and programs of the five boards and provide information on inter-Mennonite projects and overseas programs. The directory gives a listing of Mennonite-sponsored health and human services, including child welfare services; hospitals; mental health centers; and retirement homes and nursing homes. The numerous regional Mennonite archives and historical libraries are also listed. The directory also supplies information on overseas Mennonite churches and programs, including a world Mennonite directory and information on other Mennonite bodies including, among others, the Beachy Amish Church, Conservative Mennonite Conference, and the Eastern Pennsylvania Mennonite Church. The Yearbook's listings of Mennonite congregations by states and provinces include all the Mennonite and Brethren in Christ bodies in North America (Amish and Hutterites are not included). The Historical Committee of the Mennonite Church is directly responsible to the general board through the committee's executive secretary. The executive secretary is responsible for the Archives of the Mennonite Church located at Goshen (Indiana). Also directly relating to the general board in 1997 were the Afro-American Mennonite Association, the Concilio Nacional de Iglesias Menonitas Hispanas, and the integrated Mennonite Church-General Conference Mennonite Church women's group, Mennonite Women. Task forces have been regularly appointed by the general assembly to prepare study documents on issues of concern to the church. These include The Holy Spirit In the Life of the Church (1977); Biblical Interpretation in the Life of the Church (1977); Affirming Our Faith in Word and Deed (1979); Leadership and Authority in the Life of the Church (1981); and Justice and the Christian Witness (1981). General assembly study committees have also studied the issues of human sexuality, women in leadership, revision of the confession of faith (jointly with the General Conference Mennonite Church), spirituality, war taxes, and homosexuality. Not all Mennonites endorsed the pervasive changes of the 1960s and 1970s. A conservative "breaking away" took place in the Pacific Coast Conference ca. 1966-67. Segments withdrew from the Lancaster and Franconia conferences in 1969-70, forming the Eastern Pennsylvania Mennonite Church. Many of the groups listed above as not participating in the Mennonite Church (MC) General Assembly also opposed aspects of change and chose not to join the general assembly when it was formed. Others within the assembly membership formed a Fellowship of Concerned Mennonites in 1983. Several conferences designed to address their concerns were held at Laurelville (Pennsylvania) in 1984, 1985, and 1986. In the 1970s the charismatic movement, which was international in scope, permeated both leadership and laity in the Mennonite Church (MC). While some charismatic congregations were formed, both charismatics and noncharismatics endeavored to create an atmosphere of mutual cooperation and acceptance. Mennonite Renewal Services, founded in 1975, serves selected needs of Mennonites involved in the charismatic movement and functions as a liaison between Mennonite charismatics and denominational leaders. In 2013 Mennonite Church USA reported 97,737 members in 839 congregations. If church plants were included, the total membership would be 98,696 and the total number of congregations would be 904. In 2013, 25 Lancaster Mennonite Conference congregations with 3,145 members included in the Mennonite Church USA statistics in the past were removed due to their changed status as inactive congregations within Mennonite Church USA. Congregations reported an active weekly attendance of 86,333 (87,647 if church plants are included). Bender, Harold S. Mennonite Sunday School Centennial 1840-1940. Scottdale, PA: Mennonite Publishing House, 1940. Bender, Harold S. "The Founding of the Mennonite Church in America at Germantown 1683-1708." Mennonite Quarterly Review 7 (1933): 227-250. "Fifty Mennonite Leaders." The title of two series of biographical sketches which appeared in the Gospel Herald, 10 January-19 December 1929; 18 January 1934-3 January 1935. Funk, John F. Mennonite Church and Her Accusers. Elkhart, IN: Mennonite Publishing Co., 1878. Gingerich, Alice. Life and Times of Daniel Kauffman. Scottdale, PA: Herald Press, 1954. Hartzler, J. S. Mennonites in the World War. Scottdale, PA: Mennonite Publishing House, 1921. Hartzler, J. S. and Daniel Kauffman. Mennonite Church History. Scottdale, PA, 1905. Hershberger, G. F. War, Peace, and Nonresistance. Scottdale, PA: Herald Press, 1944, rev. ed. 1953. Horsch, John. "Alt-Mennoniten" Mennonitisches Lexikon I, 43-46. Kauffman, Daniel. The Conservative Viewpoint. Scottdale, PA, 1918. Kauffman, Daniel. Fifty Years in the Mennonite Church 1890-1940. Scottdale, PA: Mennonite Publishing House, 1941. Kaufman, Ed. G. The Development of the Missionary and Philanthropic Interest Among the Mennonites of North America. Berne, IN, 1931. Smith, C. Henry. The Mennonites of America. Goshen, IN, 1909. Smith, C. Henry. The Mennonite Immigration to Pennsylvania in the Eighteenth Century. Norristown, PA, 1929. Smith, C. Henry. The Story of the Mennonites. Berne, IN, 1941. Steiner, M. S. John S. Coffman, Mennonite Evangelist. Spring Grove, PA, 1903. Umble, John. Mennonite Pioneers, Biographical Sketches of Some of the Leading Men and Women in the Mennonite Church Who Have Served in the Institutions of the Church in the Home Land. Scottdale, PA: Mennonite Publishing House, 1940. Umble, John. Ohio Mennonite Sunday Schools. Goshen, IN: Mennonite Historical Committee, 1941. Umble, John. Goshen College 1894-1954. Goshen, IN: Goshen College, 1955. Umble, John. "Extinct Mennonite Churches in Ohio." Mennonite Quarterly Review 18-19 (1944-45): 36-38, 89-116, 186-92, 225-50, 41-58, 215-37, and 20 (1946): 5-52. Umble, John. "Seventy Years of Progress in Sunday School Work Among the Mennonites of the Middle West." Mennonite Quarterly Review 8 (1934): 166-179. Umble, Roy H. "Mennonite Preaching 1864-1944." Ph.D. dissertation, Northwestern University. 1949. Wenger, J. C. History of the Mennonites of the Franconia Conference. Telford, PA, 1937. Wenger, J. C. The Doctrines of the Mennonites. Scottdale, PA: Mennonite Publishing House, 1943. Wenger, J. C. Separated Unto God: A Plea for Christian Simplicity of Life and for a Scriptural Nonconformity to the World. Scottdale, PA: Mennonite Publishing House, 1951. Wenger, J. C. Introduction to Theology. Scottdale, PA: Herald Press, 1954. For further bibliography, see the articles on the several district conferences, and on specific doctrines, ordinances, and practices. See also the published proceedings of the Mennonite General Conference and the district conferences. Burkholder, J.R. and Calvin Redekop, eds. Kingdom, Cross, and Community. Scottdale, 1976. Drescher, John M. "The World Today, A Threat and a Challenge." Gospel Herald 56, no. 45 (November 12, 1963): 1001, 1004, 1021. Erb, Paul. Orie O. Miller: The Story of a Man and an Era. Scottdale, 1969. Erb, Paul. South Central Frontiers: A History of the South Central Mennonite Conference. Scottdale, 1974. Gingerich, Melvin. Mennonite Attire Through Four Centuries. Breinigsville, Pa.: The Pennsylvania German Society, 1970. Hernley, H. Ralph. The Compassionate Community. Scottdale: Association of Mennonite Aid Societies, 1970. Hostetler, Beulah Staffer. American Mennonites and Protestant Movements. Scottdale, 1987, esp. 279-329. Juhnke, James C. Doctrine, War: Mennonite Identity and Organization in America, 1890-1930, The Mennonite Experience in America, vol. 3. Scottdale, Pa.: Herald Press, 1989. Kraybill, Paul N., ed. Mennonite World Handbook (MWH). Lombard, Ill.: Mennonite World Conference [MWC], 1978: 357-62. Lapp, John Allen. The Mennonite Church in India, 1897-1962. Scottdale, 1972. Lehman, James O. Creative Congregationalism. Smithville, Ohio: Oak Grove Mennonite Church, 1978. MacMaster, Richard K. Land, Piety, Peoplehood: The Establishment of Mennonite Communities in America, 1683-1790, The Mennonite Experience in America, vol. 1. Scottdale, Pa.; Herald Press, 1985. Mennonite World Handbook. Strasbourg, France, and Lombard, Ill.: MWC, 1984: 142. Mininger, Paul. "Limitations on Nonconformity." Mennonite Quarterly Review 24 (1950): 163-169. Mininger, Paul. "Our world, Our Church, and Our College." Mennonite Quarterly Review 37 (1963): 279-309. Peachey, Urbane, comp. Mennonite Statements on Peace and Social Concerns, 1900-1978. Akron, Pa.: MCC, 1980. Proceedings of Mennonite General Conference, 1955-1969. Proceedings of Mennonite General Assembly, 1971-1997. Scottdale, Pa.: Mennonite Publishing House. Rich, Elaine Sommers. Mennonite Women: A Story of God's Faithfulness, 1683-1983. Scottdale, Pa.: Herald Press, 1983. Ruth, John L. Maintaining the Right Fellowship. Scottdale, 1984. Schlabach, Theron F. Gospel versus Gospel: Mission and the Mennonite Church, 1863-1944. Scottdale: 1980. Schlabach, Theron. Peace, Faith, Nation: Mennonites and Amish in Nineteenth-Century America, The Mennonite Experience in America, vol. 2. Scottdale, Pa.: Herald Press, 1988. Shenk, Wilbert R. et al. The Challenge of Church Growth. Scottdale, 1973. Smith, Willard H. Mennonites in Illinois. Scottdale 1983. Stoltzfus, Grant. Mennonites of Ohio and Eastern Conference. Scottdale, 1969. Wenger, J. C. The Mennonite Church in America. Scottdale, 1966. Wenger, J.C. Mennonites in Indiana and Michigan. Scottdale, 1961. Wenger, J. C. The Yellow Creek Mennonites: The Original Congregations of Western Elkhart County. Goshen, Indiana: Yellow Creek Mennonite Church, 1985. Yoder, Edward. Edward: Pilgrimage of a Mind, ed. by Ida Yoder. Irwin, Pa.: Ida Yoder and Virgil E. Yoder, 1985. Huber, Tim. "MC USA Membership Drops: Numbers Down by Nearly 7,000; U.S. Mennonite Brethren Hold Steady." Mennonite World Review 91, no. 2 (21 January 2013): 1, 13. Bender, Harold S. and Beulah Stauffer Hostetler. "Mennonite Church (MC)." Global Anabaptist Mennonite Encyclopedia Online. January 2013. Web. 25 Apr 2019. http://gameo.org/index.php?title=Mennonite_Church_(MC)&oldid=162483. Bender, Harold S. and Beulah Stauffer Hostetler. (January 2013). Mennonite Church (MC). Global Anabaptist Mennonite Encyclopedia Online. Retrieved 25 April 2019, from http://gameo.org/index.php?title=Mennonite_Church_(MC)&oldid=162483. Adapted by permission of Herald Press, Harrisonburg, Virginia, from Mennonite Encyclopedia, Vol. 3, pp. 610-616; vol. 5, pp. 564-567. All rights reserved. This page was last modified on 24 November 2018, at 14:43.